Tucked in behind the large domes of Carn an Tuirc and Cairn of Claise is the deep bowl of Coire Kander. Apart from the accessible ice climbing, there are a couple of Grade I gullies in the corrie: Y Gully and Twisting Gully. Y Gully is popular and relatively easy. Twisting Gully less so (on both counts). The shortest approach is from the A93 at the car park on the East side of the road at NO147799. You can go over the summit of Carn an Tuirc, or skirt to the North of it, Alternatively, follow the Allt a' Gharbh-coire and take the left split in Cul-Riabhach which takes you to the col. A more scenic, but much longer approach is up Glen Callater. A bike would definitely help if approaching from this side. There is one relevant Scottish Avalanche Information Service forecast for Carn an Tuirc: Coire Kander. The tour of Carn an Tuirc, Cairn of Claise and Glas Maol is a popular one, and a little side trip down Y Gully would liven up the day, without taking up too much time. The gully is clearly marked on the OS 1:50000 map. The gully gets its name due to being split at the top by a rock island. Either of the options at the start are skiable, but the skiers right is the easiest angled. As you descend, you will pass a large icefall on the left. Further round on the left is another couple of icefalls. These icefalls are becoming more popular with climbers, and it is possible that you may meet people in the gully, as it is one of the means of accessing these climbs. 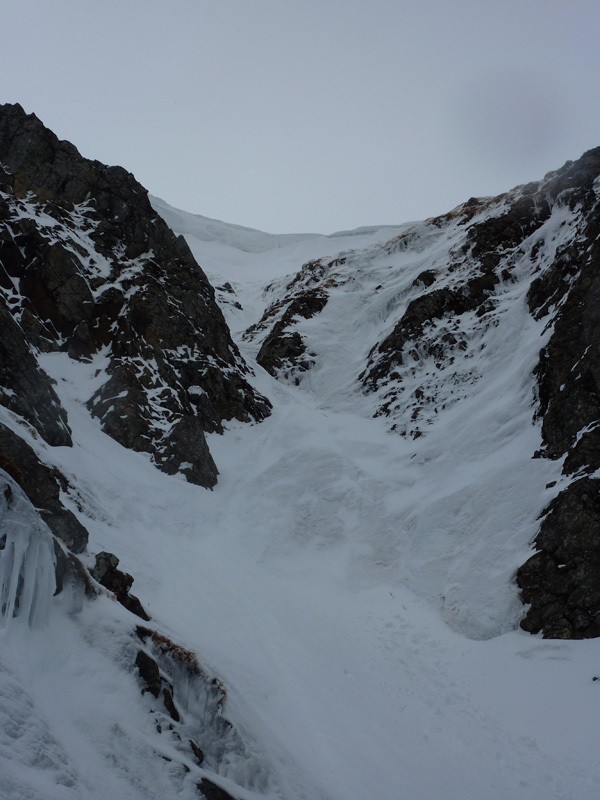 In relation to these icefalls, it's also important to make sure you have located the top of the right gully. Each of these icefalls mentioned are topped by easy angled snow gullies. Y Gully cuts back into the col much, and has the obvious rock island in it. Make sure you don't head off down the wrong one! Twisting Gully is the deep gully on the south wall of the corrie. It's a more serious proposition than Y Gully, but provides a fine second run after doing its easier neighbour. If climbing the gully first (recommended), it curves out of sight to the right at half height. Once at the bend, you will see the feature that gives the gully its name. Just below the cornice is a narrow, icy groove that twists between rock outcrops. I would doubt it's ever skiable, but someone may prove me wrong. The cornice above looks like it can be outflanked on climbers right. However, you can still ski from the top into the gully. From the bend at half height, there is a snow slope rising above to the left. Steep at first (about 45 degrees), it lies back towards the top, providing an easy top out next to a little knoll on the ridge. This is the line of the descent. The snow slope is steeper than the bed of the gully, but good snow compensates for the exposure. Notes: The grade applies to the line as described. The gully line at the top looks a little harder than Grade I when lean.